When it comes to being a middle linebacker, you either have it or you don’t. That position — much like quarterback on the other side of the ball — requires more than just athleticism and strength. There is also the element of leadership and other intangibles that must emanate from that player. The other 10 men on the field must look to him with respect and with trust. B.J. Goodson, in other words, was born to be a middle linebacker. The Giants are embracing him, essentially handing him that all-important job this summer and asking him to be the pilot of their defense. A year after he spent most of the season on the bench and playing special teams — he took 14 defensive snaps all year — Goodson is now the central figure for a group that figures to determine just how far the Giants can go this year. So far, he is making a good impression. And not just on the coaches and his fellow defensive players, but on the guys he is hitting, too. Ben McAdoo said the Giants are practicing at “thud tempo” when they are in pads, which means giving players a pop but not wrapping them up and tackling them to the ground. Sometimes players do leave their feet, though, and it seems as if in every practice, Goodson has taken a ballcarrier off his feet. The second-year player certainly seems to be bringing a physicality that was missing last year. While the major concern regarding Goodson stepping into the starting role was and likely still revolves around his leadership and ability to make the calls and checks at the line of scrimmage, he’s showing that hitting people is not a problem. “B.J. there, it’s his first season as a starter, so maybe he is trying to make a point or something, I don’t know,” running back Orleans Darkwa said after being lit up by the linebacker on a screen pass Thursday. 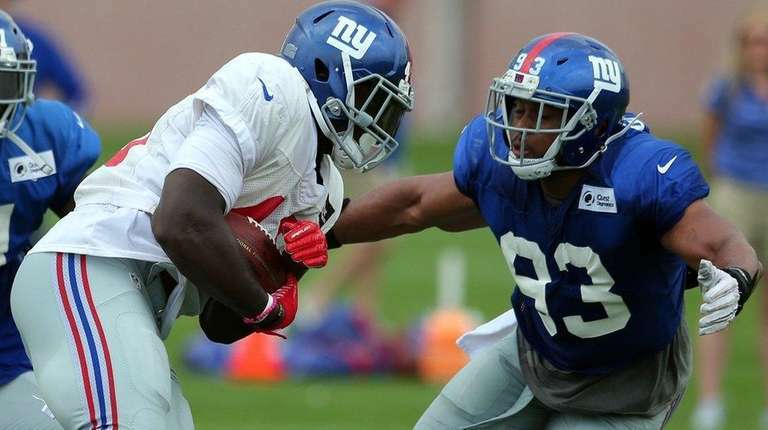 Darkwa was visibly shaken and taken to the side for evaluation, but he returned to practice. McAdoo said that Goodson’s hit there — and the others he has delivered in camp, including one on Sterling Shepard on the first day of practice — are within the boundaries of this camp’s protocols. Goodson is happy to deliver that. That goes into the central casting version of a middle linebacker too, along with the attitude. And all of it had better be authentic. What happens to them? They become outside linebackers? That seems like something a real middle linebacker would say.